Speaking to reporters aboard Air Force Once, White House press secretary Sarah Huckabee Sanders blamed scheduling conflicts on both sides for the fact that the leaders will not meet formally during the Asia-Pacific Economic Cooperation summit taking place in the coastal city of Danang. But Sanders said it was “possible” and “likely” that they could have a less formal encounter, either in Danang or later in the Philippines when Trump and Putin attend another regional conference. Both sides have been working to reach agreement on how they hope to resolve Syria’s civil war once the Islamic State group is defeated. The potential understanding comes as an array of forces are near a final defeat of IS, the extremist group that once controlled vast stretches of both Iraq and Syria. Fighting the group is no longer top priority, shifting the focus back to Syria’s intractable conflict between Russian-backed President Bashar Assad’s government and armed rebels, to whom the U.S. lends at least rhetorical support. The news comes a day after Trump set aside his blistering rhetoric in favor of friendly overtures to China on Thursday, trying to flatter his hosts into establishing a more balanced trade relationship and doing more to blunt North Korea’s nuclear ambitions. On trade, Trump criticized the “very one-sided and unfair” relationship between the U.S. and China. But unlike his approach during the campaign, when he castigated China for what he contended were inappropriate trade practices, Trump said Thursday that he didn’t blame the Chinese for having taken advantage of the U.S. Reacting from afar, Sen. Bob Menendez, a Democrat from New Jersey, said Trump’s comments “make the United States look weak and as if we are bowing to China’s whim. ... Instead of giving China credit for stealing American jobs, the president should be holding China accountable.” Menendez, a member of the Senate Foreign Relations Committee, is on trial for alleged bribery. Tillerson offered a blunt assessment of China’s trade surplus with the United States, which in October widened by 12.2 percent from a year earlier to $26.6 billion. The total surplus with the United States for the first 10 months of the year was $223 billion. 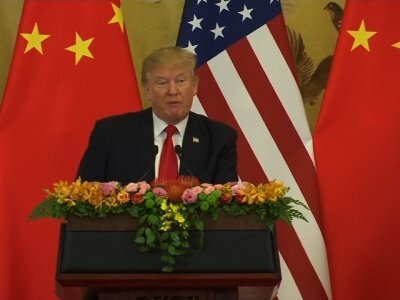 Trump appeared far more conciliatory on Thursday, thanking China for its efforts and saying he’d been encouraged by his conversations. Associated Press writers Christopher Bodeen in Beijing and Darlene Superville and Ken Thomas in Washington contributed to this report.